Liars for Christ - We need them! - Website of reckersworld! God won’t prove himself to you? Perhaps he hates your guts? So you lack faith? So did the disciples! You too can have the holy spirit in your church! Liars for Christ - We need them! Lying is a sin is it not? Is it? Really? I mean is a white lie ok, like when you tell your 3-year-old son that his picture he drew is lovely when it looks more like he’s thrown up all over it? Or like when you tell your wife that she does not look fat in that dress when really she looks like a total porker in it? Of course sometimes it’s ok to lie. We know that. God knows that. Lying is not always a sin and I will demonstrate to you how sometimes lying is quite alright and in fact necessary! When I was a young Christian, in the early 90s I was in church one day. A visiting American pastor by the name of Jimmy Stinton, or something like that, came to speak. He was a former WWF pro-wrestler I’d never heard of. I was a wrestling fan so thought, yes, I must hear this man. However, as soon as Jim started preaching, I couldn’t believe it. He started talking as if pro-wrestling was real! As if the sport wasn’t staged and as if nobody knew the outcome of matches beforehand. It shocked me, my dear brothers and sisters, that a visiting evangelist could so blatantly lie about something in the pulpit! Clearly, my brothers and sisters, this conversation never went down this way, if ever at all. Any pro-wrestling fan knows… even back in the early 90s that if a title was going to change hands it had been planned well in advance. 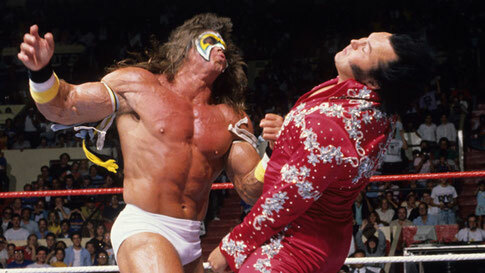 There was no question that the Ultimate Warrior was going to destroy the Honky Tonk Man in under 30 seconds, because that was the plan. Jim Stinton, being a pro-wrestler himself would have known this full well and the Warrior would not have laughed in such a haughty manner, even if he had been asked such an ignorant question. I didn’t argue. I just went away, fuming that the man of god could so blatantly lie to people, when he was supposed to be there as God’s spokesperson. Here he is talking about pro-wrestling as if it's real and then goes on to talk about God and stuff in the bible? All that mattered to Paul was that the gospel had been preached, not whether the preacher was honest or not, and so should it be the same for us, my brothers and sisters. As long as Jesus is promoted amongst the heathen it doesn’t matter whether what we preach is true or not! We can lie to our hearts content! We can lie about what Jesus has done for us. Lie about miracles that never happened. Exaggerate, my brothers and sisters! Make it up! Twist it! It doesn’t matter, just as long as Jesus is glorified and people are brought into the kingdom. HALLELUJAH! PRAISE THE LORD! Be a liar for Christ. That is one time where lying is NOT a sin. PRAISE GOD!